Shiny Electrode in game: 46 Who? Important notice! 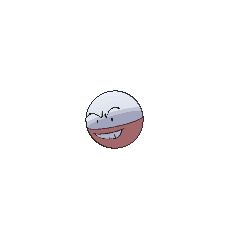 Pokemon Shiny Electrode is a fictional character of humans. An Electrode under the ownership of the Navel Island Gym Leader Danny appeared in Navel Maneuvers. It reappeared in a flashback in A Way Off Day Off and in another flashback in Hello, Pummelo!. Electrode's appeared during The Underground Round Up. A town was over-populated with the Ball Pokémon and a man named Poncho had a job of removing them. Multiple Electrode were used as security measures for an electric company in Current Events. In What You Seed is What You Get, an Electrode owned by Natasha that was painted like a watermelon was guarding a patch of watermelons. In Pearls are a Spoink's Best Friend, Spoink thought that an Electrode was a pearl. When the group tried to take it off its head, it exploded. In Pinch Healing!, Jessie unintentionally and indirectly caused an Electrode to fall and explode on a bus that a Poké-sitter was driving. 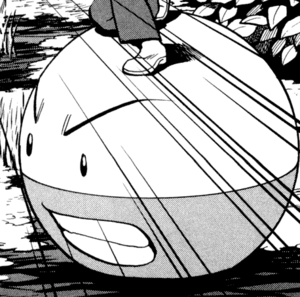 Electrode's first appearance was during The Flame Pokémon-athon. It was used in a Pokémon Race. When Team Rocket was trying to infiltrate Professor Oak's lab in Showdown at the Po-ké Corral, they fell into a pit of Electrode. An Electrode was part of an exhibition in Flower Power. 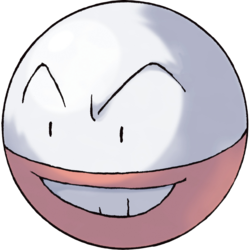 An Electrode appeared in Beauty and the Breeder where it participated in Bonitaville's Pokémon Beauty Contest. An Electrode also appeared in Celebi: Voice of the Forest and Pokémon Heroes: Latios & Latias. Several Electrode were among the Electric-type Pokémon that were lured by the "Miracle Crystal" that Attila and Hun were using in The Legend of Thunder!. An Electrode appeared as a mask for the festival in Capacia Island UFO!. A Trainer's Electrode appeared in Summer of Discovery!, Foggy Pokémon Orienteering! and Battling Into the Hall of Fame!. Four Electrode appeared in The Future Is Now, Thanks to Determination!. 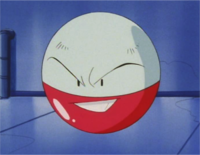 EP114 Electrode Ash's Pokédex Electrode, the evolved form of Voltorb. Highly concentrated electric energy causes this Pokémon to explodeunpredictably. Also known as "The Bomb Ball." Multiple Electrode made an appearance in The Lake of Rage, being used to power Team Rocket's radio wave generator. A drawing of an Electrode appeared on a store in Violet City's Famous Rice-Cake store in Number One Donphan. Eusine, as seen in Jumping Jumpluff, possesses an Electrode as well, allowing him to travel over large distances by riding it. Eusine's Electrode apparently uses electric charges to suspend itself in mid-air. It was temporarily given to Crystal to follow Suicune in Indubitably Ditto to Great Girafarig where they reached the Tin Tower. It had helped Crystal float during the battle against Suicune in SUddenly Suicune I to Suddenly Suiunce III, in the latter it was seen over the debris near the Tin Tower, and was later retrieved back by its owner. 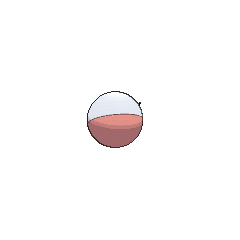 In The Last Battle XIII an Electrode was one of the Pokémon sent to help the fight in Ilex Forest. Wattson's Electrode was only seen in the Power Plant located in New Mauville. 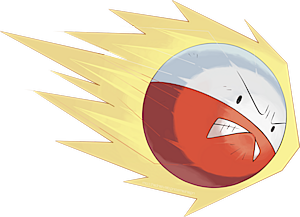 Electrode was selected as an enemy Pokémon for the Frontier Brains' demonstration battle in the Emerald chapter, alongside Swalot, which represents illustrator Satoshi Yamamoto. In a flashback an Electrode appeared as a Pokémon trained by the International Police in Innocent Scientist, also alongside Swalot. In the original Smash Bros. Electrode would appear from the doorway atop the Silph Co. building on the Saffron City stage and use Explosion, damaging any players near it. In the sequels, it would be released randomly from a Poké Ball. When released, Electrode will pause for a few seconds before using Explosion. It can be picked up and thrown, though this is risky as Electrode will hurt everyone near it, including the player who threw the Poké Ball. Electrode functions in Brawl in much the same way as in Melee, however, sometimes, it will fail to explode. Other times, Electrode will merely pretend to fail to explode, then explode suddenly after a few seconds. 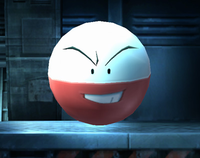 Electrode appears in fourth installment, functioning the same as in Brawl.